Here's a family post for you. It's Father's Day this weekend, and my sister is visiting with her family. Don't be surprised if you see stories next week. I'm so appreciative of my fantastic family (you may remember the Best Family Photo EVER from this past Christmas). My sis- not only is she one of my best friends (and always has been), but she also shares my passion for food (you may also know that she is responsible for me adopting the paleo/primal lifestyle). 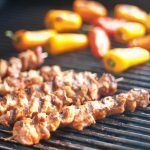 She's influenced multiple recipes (including but not limited to Candied Maple Pecan Yams and Curried Pumpkin and Apple with Raisins), but I think this is the first one of her recipes that has made it on the site. It's possible I may be wrong about that, but I can tell you that I have been wanting to share this one with you for a while. 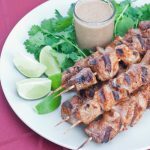 This 4-ingredient Paleo Satay Sauce is straight out of Devi's The Book of Yummy Magic recipe collection. Check out the website with more stories at #TellThemNow. Pop, I've always been proud of what a great teacher you have been; to your kids and your students. Years after moving away from home I met some of your ex-students who told me that you were their favorite teacher. And they always remember how you had those ducklings and/or chicks follow you around the school (Dad would hatch them lil' guys in his class, and the baby birds would imprint on him and follow him around like he was their mommy). It's because of you and Mom that I've always wanted more than just a job, but something where I made a positive impact on others' lives. I'm not sure that I've ever told you guys that, but it has always come up in interviews in the past. I appreciate all the time you spent with us growing up especially practicing sports. Devi and I are very appreciative that you and Mom lead healthy lives and that you've had that positive influence on us as long as we can remember. I love you Pop. Enjoy your visit with your grand sons before they come down here! Make sure Dev gives you a hug for me. For everyone else, please tell us (and your dad) what are you appreciate about your fathers and what makes you proud about them. Ah-ight! 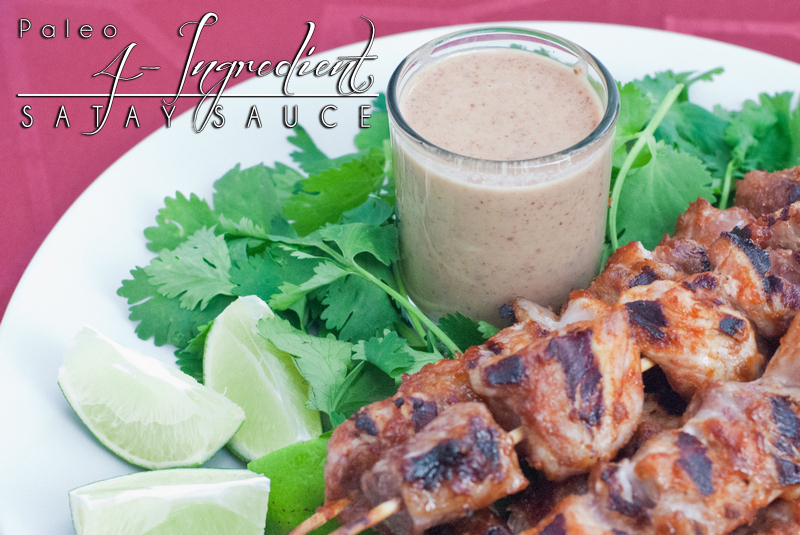 Back to this Magical Paleo Satay Sauce: this stuff is amazing on paleo pizza (I will have to post the recipe I have in my head sometime), on BBQ'd pork (as in the photos), chicken, prawns, or just on a spoon. This is one of those things I lick the bowl clean (good thing I don't have a dog, cause it would never get any scraps from my table)!!! From my family to yours: enjoy! How can 4 ingredients make so much magic? 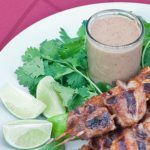 I dunno, but not surprisingly Devi really delivered on this Paleo Satay Sauce – fantastic on everything! water, upto 1/4 cup ***water doesn't count as an ingredient in my books. Plus you might not need it. Mix the four ingredients together. Add water gradually while stirring well – if needed – to get desired consistency. The amount of water needed will probably depend on the almond butter you're using. I made this recipe last week and I needed almost the full 2 cups of water because the almond butter I was using was super thick, but the new jar that I used to make it today was warm and thin and only needed a tablespoon of water. Great write-up! Enjoy your week with your family!